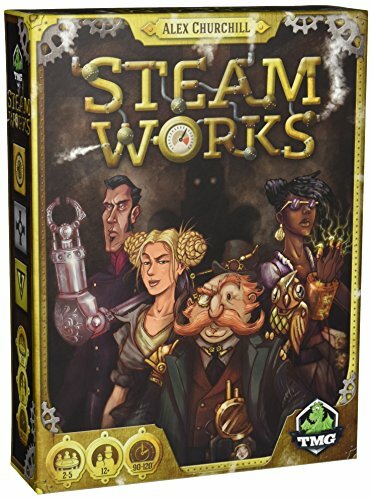 Steam Works Review - Steam Punk Machinations Run Wild — GamingWithSwag.com - Dads By Day, Gamers By Night. 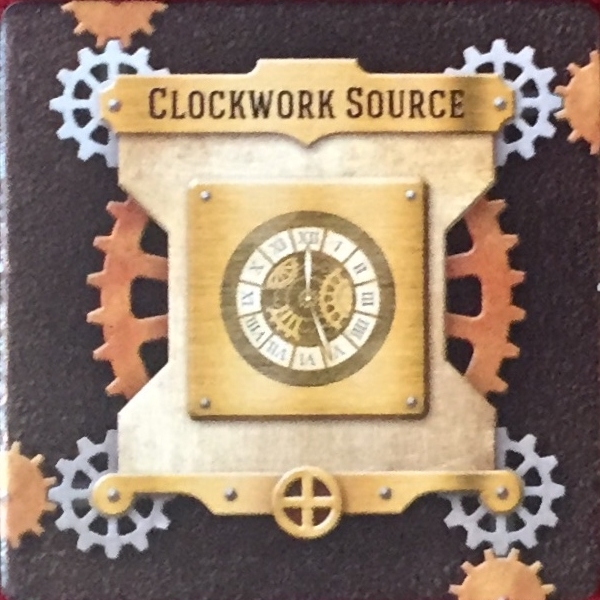 You are vying to be the head inventor for the Queen in this Steam Punk worker placement game where you build machines to place your workers on. As the game progresses you and the other players can make more useful and creative machines and fight over placement on the best devices. While most worker placement games have preset boards, this one is created by the players beyond a few basic items like grabbing components and energy sources with which to build. The game has three "Ages" with each new age making new components available as well as granting additional workers and the game advances based on how often people are using each other's machines. Machines start simply like having a single source and component and by the end single machines can accept more than one worker and grant a bevy of bonuses. The winner is determined by points earned by building machines, getting others to use your devices, and converting in game resources into victory points before the final tally. Not a strength. The book is large and several things in the game are not clear or straight counter intuitive and it can be tough to sort it out even with the book. The first time we played the game we had to look up a few questions on the internet. Not everyone loves Steakpunk, like our reviewer Brad who may have a diagnosable allergy to it, but I think the theme fits well and besides the art styling of the character cards it isn't really prevalent. Set-Up and Takedown is reasonable for a game with this many pieces, and there are many individual baggies included and they are clearly marked to keep things separate. In addition, adding up the points for the winner was much easier than I anticipated. The components are thicker cardboard stock that should hold up to shuffling, meeple placing, and light abuse. The wooden meeples which have top hats and the larger Automatons are well made and durable. I love most worker placement games so I was thrilled at the idea of building the places for workers to go and trying to entice others to use my sweet machines. The building element is the strength of the game, but it has a few flaws. The biggest is that it is tough sometimes to build new machines or add to your existing ones in a timely manner. You envision giant machines and in reality you don't have the freedom to make them. The second biggest problem is that it is increasingly tough to figure out what the other players built. You find yourself asking "Who has a machine that does this?" a lot because you can't really tell what things do at a distance. The first time you play the game you will build some machines that in retrospect were lame and you will get better at telling which components are the sexiest and worth hustling to get. I think a more polished version of this game would easily be one of my favorite games as it has a ton of replay potential, but I recommend picking the game up in the 40 dollar range where I think you get the right bang for your buck. Thankfully, it looks like Amazon and a few other retailers are starting to sell it in that range so bust out your monocle and get tinkering.